Shiva was a Hindu fertility god, who made the crops grow. He was not mentioned in the Rig Veda, about 1000 BC, and seems to have come into Hinduism later than that. Around 300 BC, in the Mauryan period, people began worshipping Shiva. This might be another name for the Harappan god Rudra. But unlike the earlier Hindu gods, Shiva didn’t want animal sacrifices. In addition, bulls were sacred to Shiva, and because of this most Hindus, beginning at the time of the Mauryan empire, would not (and still won’t) eat beef. Shiva (or Rudra) was less like a real man than Vishnu, and scarier. People thought Shiva spent most of his time meditating (sitting and thinking) on top of Mount Kailas in the Himalayas, and it was this mediation that made the spiritual energy that ran the universe. Sometimes people made statues of Shiva, like this one here, but more often they showed him in the form of a lingam, a short stone pillar. The Ganges river, according to tradition, came out of the head of Shiva, and that made the river and its water sacred. People went to bathe in the Ganges if they were sick, so the holy water could make them better. Some pictures of Shiva show him with blue skin, because he is the source of the river. Cite this page: Carr, K.E. 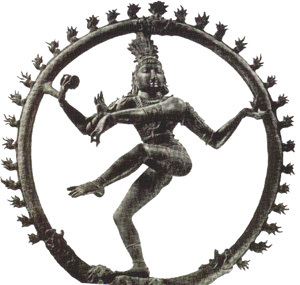 Shiva – Hindu god – Ancient India. Quatr.us Study Guides, July 21, 2017. Web. April 25, 2019.